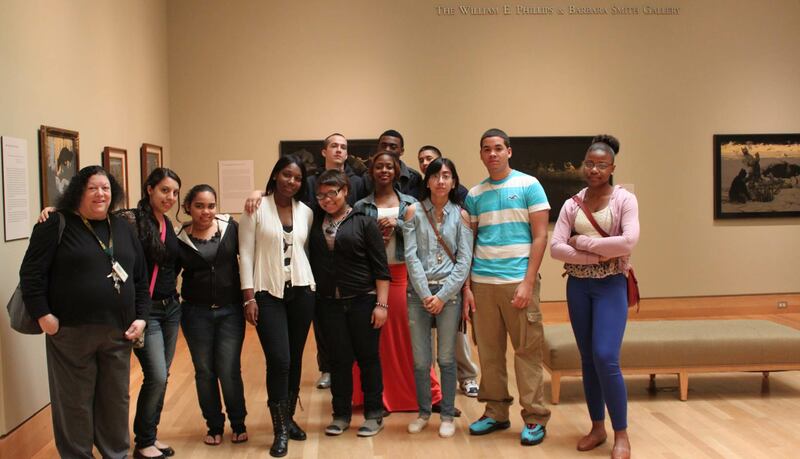 The Museum is the perfect place to engage youth groups of all ages. From Scout Troops to Afterschool Clubs, the Museum’s hands-on/minds-on approach to art, history, and nature can be tailored to your group’s particular interest. Troops and Youth Groups have the option of an age-appropriate tour of the historic boardinghouse and art galleries. An art lesson and hands-on project are available as well. To take advantage of this full tour, allow approximately 2 1/2 hours. Museum Welcome (10 minutes), Tour of the historic Griswold House (30 minutes), Tour/learning-to-look game in the Krieble Gallery (30 minutes), Hands-on Project Based on availability (60 minutes), Travel time between activities (10 minutes), Clean-up of art project (10 minutes). Talk to our Museum Educator about your goals and they will customize a terrific hands-on, minds-on experience. Book a visit to the Florence Griswold Museum to complete steps for an official Girl Scout badge. To book a visit you can fill out the form below. Time is available to reserve for most afternoons (not during October). 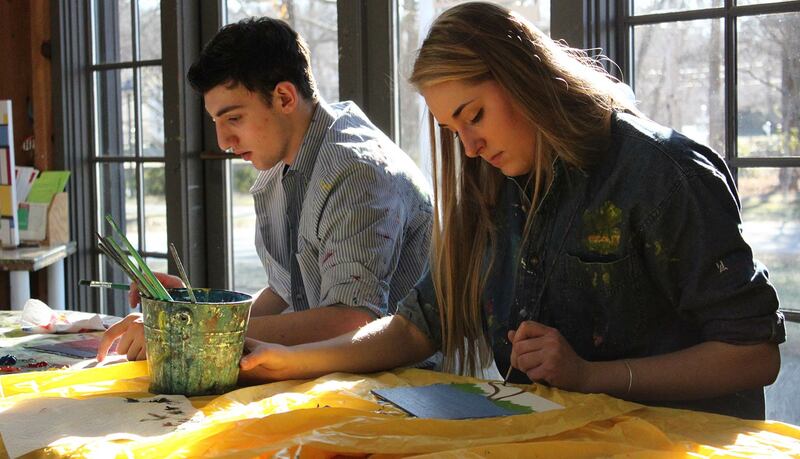 The Florence Griswold Museum is all about painting. Girls can complete several elements for the badge in one visit, or come back again and again. Visit includes applicable activities from Steps 1, 2, 3, and 4. Step 1. Get Inspired: Girls get an interactive tour of the art on view in both the galleries and historic house discussing the artist’s use of paint. Girls will identify at least 5 paintings they love and decide why they are great. Discussions include the artists’ chosen “styles” of either Tonalism or Impressionism and how they differ. Step 2. 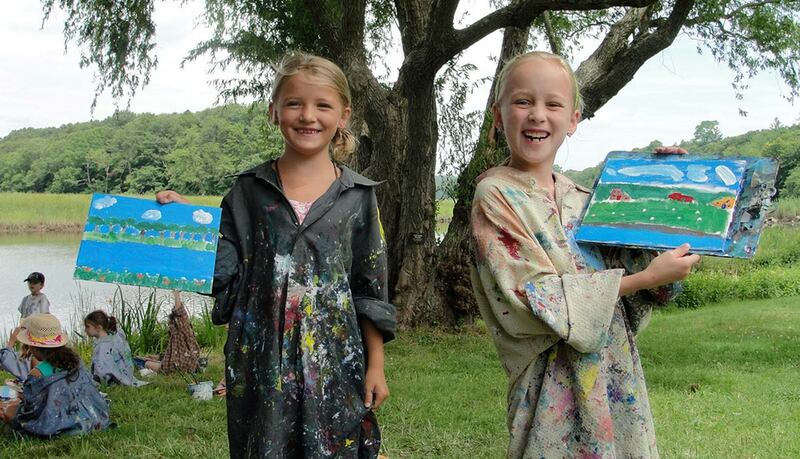 Paint the Real World: After a mini lesson in mixing paint and creating a successful landscape composition, Girls will create their own Impressionist landscape en plein air (meaning outside) using traditional materials. Step 3. Paint a Mood: Girls work hands-on with paint to create an abstract work (not a picture of objects or people) that captures a feeling or mood. Using color and line, girls can paint feelings such as peace, happiness, or anger. Together the girls will talk about their color choices. Step 4. Paint Without Brushes: Tools are important, but this activity challenges the girls to paint without traditional brushes. Girls can choose to paint with something from nature (leaves, twigs, feathers) or indoor objects (cotton balls, Q-Tips, sponges) to create a painting. These non-brush mark markers add layers of character and texture to the finished works of art. The Florence Griswold Museum is an ideal place to discuss and learn about pottery. Girls can complete several elements for the badge in one visit, or come back again and again. Visit includes applicable activities from Steps 1, 3, and 4. Step 1. Find Some Pottery: Girls will enjoy an interactive tour of the historic Griswold House identifying all the different ceramic objects on view and what they were used for. Step 3. Make a Simple Pot: Girls will create their own clay dish, bowl, or pot. Girls will learn several classic pottery techniques including “pinch,” “slab,” and “coil” construction methods before making their own form using self-hardening clay (no kiln required). Step 4. Make an Art Piece: Turn a square of tile into a work of art at the Museum. Experiment with color and pattern by decorating the tile with glass paint and liquid markers. The Florence Griswold Museum is an ideal place to discuss and learn the fundamentals of art–drawing. Girls can complete several elements for the badge in one visit, or come back again and again. Step 1. Experimenting with Different Materials: Girls will draw a still-life composition in the Education Center or landscape on the Museum grounds using three different mediums (paint, colored pencil, pastel) and compare and contrast the differences in tone, texture, mood, and color of each. Step 2. Learn How to Add Shading: Girls will refine their drawing skill by experimenting with the effects of light and shadow in a still-life composition using black pen pencils and charcoal. Girls will experiment drawing subjects with only one color. They will also learn how to use hatching, crosshatching, and smudging techniques to draw shadows. Step 3. 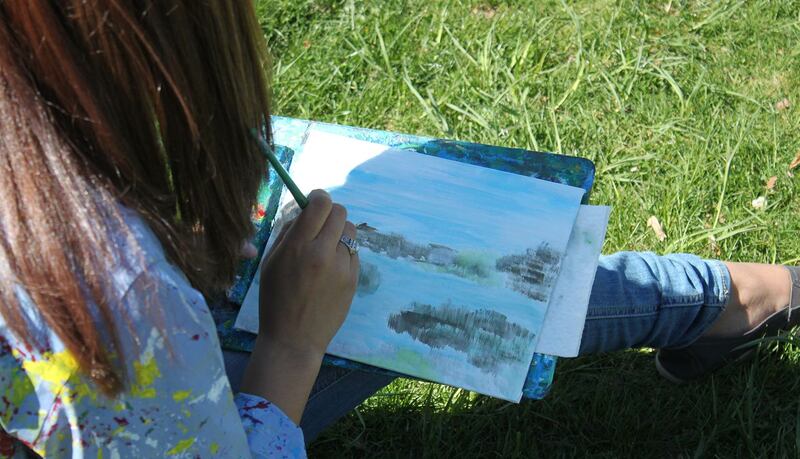 Get Some Perspective: Girls will draw an outdoor scene down by the river or out in the Museum gardens and learn how to construct a landscape using perspective to depict space. Step 4. Use your Imagination like a Graphic Artist: Girls will see how the Museum’s story can be told in cartoon-like drawings by famous cartoonist James Stevenson and award-winning artist David Macaulay before drawing a comic version of their own. The Florence Griswold Museum is an ideal place to discuss and learn about book arts. Girls can complete several elements for the badge in one visit, or come back again and again. Visit includes applicable activities from Steps 3, 4, and 5. Step 3. Try out Book Artist Techniques: Girls will learn how to fold, cut, cover, glue, and assemble the book before decorating the inside pages with a variety of creative materials including ink stamping, metallic paint, collage, stickers, fabrics, historic papers, and found objects. Several other mini book forms will be introduced as well. Step 4. Focus on Function: Girls will learn how to fold, cut, cover, glue, and assemble the book to be used as a scrapbook, memory book, or personal journal. Step 5. Focus on Style: Girls will learn how to alter an old book using a variety of creative techniques such as folding, cutting, weaving, and collaging. Pages can be enhanced with paint, ink stamps, and stickers. The possibilities are endless. Girls can bring an old book to alter or choose one from our altered book collection. All other materials included such as textiles, decorative paper, ink stamps, as well as vintage images and wallpapers. Please check back for new scouting program options. The Florence Griswold Museum is happy to create hands on/minds on programming with troop or group leaders. Please contact us to reserve troop programming (Minimum 10 girls, Maximum 25 girls and 10 adults). Most Girl Scout programs include a Florence Griswold Museum Fun Patch. Patches can be included for any group at an addition per patch charge. The Fun Patch is also available in the Museum Shop.